JAVZILLA: DEMOTLION DOVE debuts at SuperMarket at MELTDOWN comics!!! DEMOTLION DOVE debuts at SuperMarket at MELTDOWN comics!!! This Sunday, March 30, I will be debuting the DEMOLITION DOVE Preview Sketchbook! 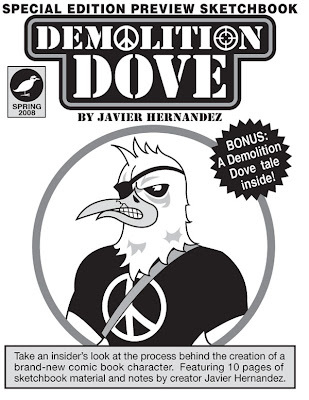 A magazine-size limited edition book featuring 10 pages of sketches and commentary, plus a 4 page Demoltion Dove tale!!! This is my brand new character and I'm very excited to be working on this. 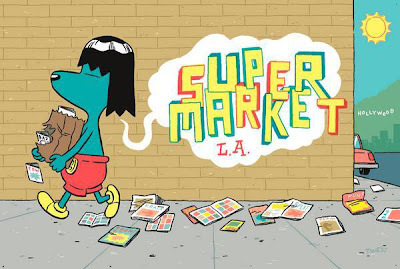 SuperMarket will be held from 12-6pm at MELTDOWN Comics in Hollywood. Meltdown is one of the great LA stores and they've always been big supporters of independent and small press. 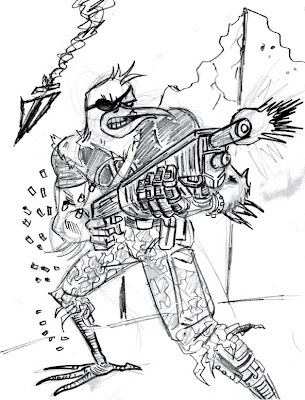 The DEMOLITION DOVE Preview sketchbook will contain 16 pages of Dove goodness. A 10 pg. sketchook section with character designs and notes plus a 4 pg. Demolition Dove short story, pencilled, inked and lettered by yours truly. The comic will eventually see print later this year under a brand new imprint I'm starting with my friend Ted Seko. It's called XOMIX COMIX and the books we'll publish under this banner will be mini-comics in the form of photocopied, limited run publications. Underground all the way! EL MUERTO actually started as a b&w photocopied book, so call me superstitous or frugal, but I have a good feeling about proceeding this way with the new book. I will of course have copies available through this blog after the SuperMarket, so don't fret, all you out-of-towners! This book will most likely be kept in print at least until the actiul comic book comes out (which is scheduled for the Fall of '08), but ya never know. I'm also going to do a limited number of 'blank' covers which will allow for unique hand-drawn covers by me. Not sure yet of how many, but they'll be signed and numbered and once they're gone, that's it!! One of the sketches inside the book. Hope the event was good for ya! I love this character. I wanna see more. Cant wait to pick up the boo, Javier. Wizarld World LA 2008- The Wrap Up! Jose Cabrera and a WizardWorld LA wrap-up tonite! EL MUERTO wins BEST FEATURE FILM! !